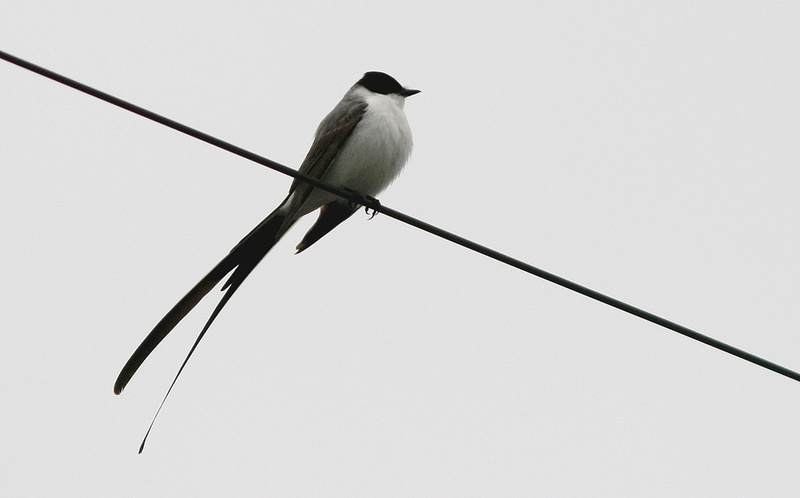 This adult Fork-tailed Flycatcher was present in Renews for more than a week in October 2011. Even though it marked the fifth record for Newfoundland, it was the first to stay around long enough to be enjoyed by birders. Origins: Resident from central Mexico to South America, however southern birds are austral migrants (moving north for winter). Accordingly, a few wander north to the United States and sometimes Canada each year. It is a striking bird that is often noticed and reported by “non-birders” when found outside its normal range. Record Details: Five records for Newfoundland: (1) The first record was an adult photographed in Stephenville on ????. The sighting was not reported until a photo was published in a local newspaper. (2) An immature bird was photographed by a local birder near Mistaken Point (Cape Race area) on July 8, 2006 but never relocated. (3) An adult was photographed by residents at Chapel’s Cove, CBN on September 19, 2010. The photo was submitted to a regional newspaper two days later, coming to the attention of birders who were unable to relocate it. (4) Another adult (potentially the same) was photographed at Flatrock (north of St. John’s) on September 29, 2010. again, the photo was submitted to the writer of a regional newspaper column several days later. (5) Finally, on October 14, 2011 an adult was reported by residents at Renews, where it stayed until October 23 and was enjoyed by local birders. It had apparently been present since ~October 12.